Quilting batik fabrics is a great pastime to enjoy because of many reasons. To begin with, batik fabrics used for quilting are most of the time unused pieces of batik textile that is usually discarded. There are, of course, pieces and strips of batik for sale; however, the commercial value of those pieces generally arises from the popularity of quilting itself. Besides, quilting is also an enjoyable and healthy pastime. It is a fun and stress relieving way to create beautiful quilt result. Quilting batik fabric is also an excellent way to transform pieces of batik fabric that don’t look very nice into a product that is not only beautiful, but also commercially viable. There are so many interesting things to discuss when it comes to quilting batik fabrics. Here we will elaborate some of the most fascinating topics about quilting with batik fabrics, including the best colors and patterns for batik quilt, how to quit with batik fabrics, how to quilt with jelly rolls and fat quarters, and how to quilt with 108-inch batik fabric. When you plan to make a quilting batik fabric, color and pattern will become your primary concern, because a quilt is supposed to be colorful and flashy. Of course, you can still make batik quilt with calmer tone, but because you will be using patches of fabric in your design, color and pattern difference still becomes an important matter to mind. When it comes to choosing color and pattern for your quilt, batik is perhaps the best fabric to work with because batik is already available in various colors and patterns. You only need to know how to pick the right batik styles. Here we show you how to choose the right styles based on the colors that you want to incorporate in your design. If you are looking for light colors for your batik quilt, such as white, yellow and cream, you mostly need to look into coastal batik fabrics, especially those made in Pekalongan and Indramayu. Nonetheless, this doesn’t mean you cannot go inland, because batik fabrics made in Ciamis and Garut are also known for their bright colors. In fact, you can actually go to as far as Yogyakarta. Although batik fabrics made in Yogyakarta and Surakarta are known for their deep brown colors, Yogyanese batik fabrics are brighter than their counterparts in Surakarta. Adding bold colors to your batik quilt will give it a lively look. Cirebon is the right city to visit if you are looking for bold-colored batik fabrics. Batik Trusmi is especially known for its colorful fabrics. If you are looking for bold shades of red, blue, orange, and yellow, you will find Cirebon the most colorful city to visit. Given that Cirebon is also a coastal city, you can also find bright colors there. 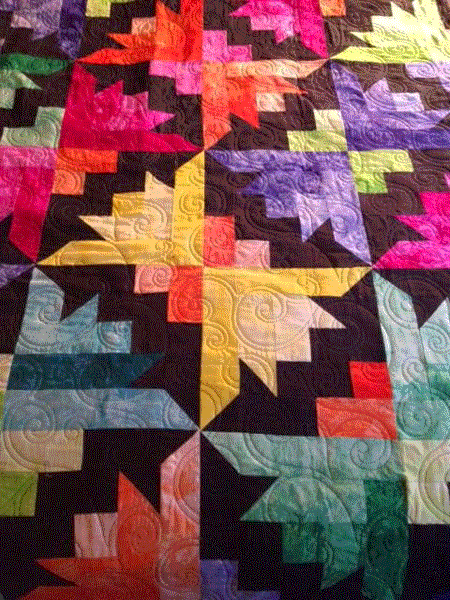 To create contrasting look in your quilt, you need to add dark colors to your batik quilt. Darker colors in batik are generally represented by brown, blue and their shades. Solonese batik fabrics are known for their dark brown hues and Sundanese batik fabrics sport dark colors like blue, indigo and purple. Although this is a generalization, you can find those dark colors easily if you visit those places. With all batik colors in your stock, you can arrange different colors to make eye-catching quilt patterns. There are so many patterns to choose from, including common patterns, such as flowers and animals (elephant or butterfly), and traditional patterns reminiscent of Indonesian culture, such as Javanese puppet and the Garuda bird. You can make the pattern either as a single big pattern made by combining patches of batik fabric or small tiled or repeating pattern on the surface of your quilt. More ingenuous patterns can be made if you use jelly rolls. Before you do quilting with batik fabrics, you may want to wash them first before using them. Batik fabrics are prone to color bleeding when washed. If it occurs after the quilt is finished, it will devastate the quilt. Prewashing prevents this by allowing the fabrics to bleed before being used for quilting. Prewashing also removes unwanted chemicals and contaminants and prevents fabric shrinking after the quilt is finished. How to wash batik fabric? To wash batik fabric, there are several important things to mind. It is recommended that you wash by hand and not with a machine. Use warm water, if possible avoid detergent and use shampoo instead. In fact, herbal cleaners, such as orange peel, are still better than shampoo and anything chemical. Don’t mix batik fabrics with other garments as bleeding can be devastating. If possible, avoid wringing the fabric or drying it using machine. Air the fabric to dry it, but avoid direct exposure to sunray to prevent color fading. With proper prewashing procedure, your batik will be ready for quilting. 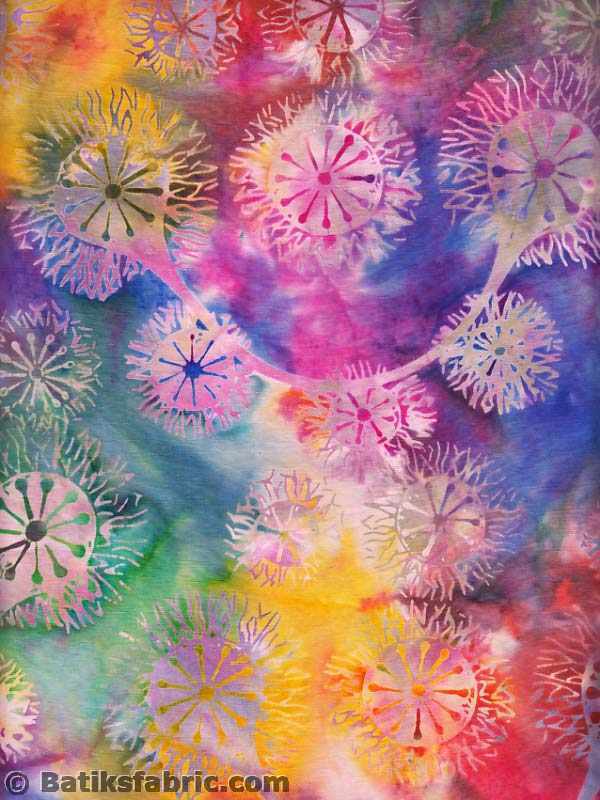 Here are several types of batik fabric that you can transform into beautiful quilting products. What is jelly roll? Jelly roll is pre-cut fabric measuring 2.5” wide and 44” long. It is thus a long strip of fabric that you can cut and arrange the way you want. With correct cutting and assembling techniques, you can create many patterns, including railway, jam, twist, slice, and check patterns. PDF instructions of how to make those patterns are available on Fat Quarter at online fabric store and many other places on the internet. Jelly rolls are already sold in strips, so you don’t have to cut the fabric yourself to make the strip, although you can also do that if you have spare bali batik fabric that you don’t use. What is a fat quarter fabric? A fat quarter is a yard or a meter-long fabric that is cut in quarters into four different pieces with the same size and shape. The size of a fat quarter is approximately 0.5 yard x 0.5 yard or 0.5 meter x 0.5 meter, depending on the measurement used in the original fabric. The exact size in inches and centimeters is approximately 18” x 22” and 46 x 56 centimeters. Fat quarter is a good selection if you want to make larger parts of a patchwork. What is a 108” wide fabric? A 108” wide fabric is considered an extra-large fabric that must be used with proper planning. Due to its enormous size and expensive price but usually for bed linens , many quilters actually avoid it and prefer to use fabric in yardage. However, with ingenuous handling, this fabric can actually be used to make state-of-the-art product. With a 108” wide batik fabric, you can save quilting time by not piecing the back layer and create cleaner look due to the seamless characteristic of the fabric. There are other types of Indonesian batik fabric that you can use, including the unique batik fabric available in yardage and pieces. You can combine all of them to create an excellent quilting product.